I’m starting to get really burnt out on this one and had to force myself to get it to this point over lunch. (With apologies for the cruddy iPhone photo). The next time I do a still life I have to be sure to not have so many repetitive details. 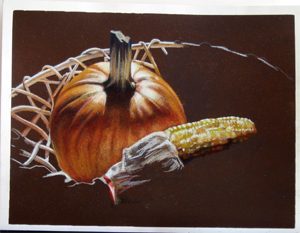 The basket, the corn…its really just not that much fun. I feel like I’ve been drawing the same damned thing for days now. 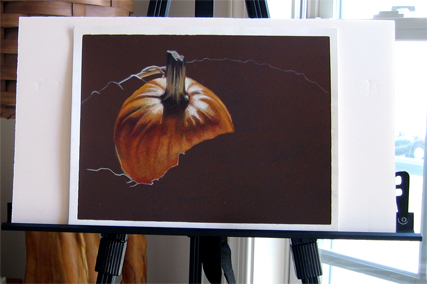 For all you smug bastards out there that said “oh sure, but can he draw a pumpkin?”. 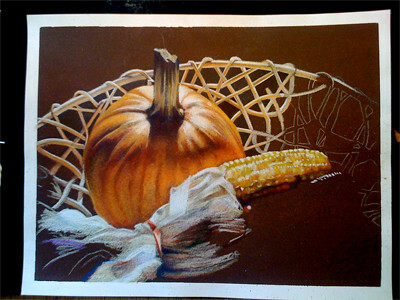 That said I was afraid to draw a pumpkin, that I wasn’t man enough to draw a pumpkin! That I use italics with abandon! My aunt was a very important person in my life. Many of my most cherished memories of my childhood involve her. From taking me to the Natural History museum in D.C. to see the dinosaurs for what seems like every weekend to me, to getting me interested in computers and technology, she was a huge influence on me. She even tolerated me as a roommate for my first semester of art school until I moved into an apartment with some friends. This painting has hung on the same spot on her kitchen wall for the past 30 years. It comes into my possession now because my Aunt passed away in April. This and many of the other things that have been turned up in her home by my parents are a warm reminder of how much she thought of me as well. Most of the major elements of the figure are blocked in now – clearly they need some refinement but I think its working so far.